Incredible traction - remarkably customizable. Fastway by ProMotoBillet designs what very well may be the most adjustable footpegs in the offroad world. 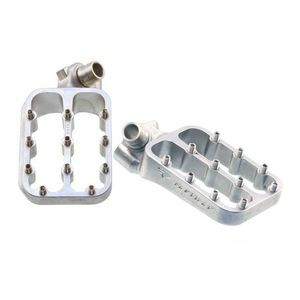 The Fastway Evolution III pegs use a virtually indestructible stainless steel body with two-position mounting options in the clevis via the Fastway Universal Collar System. The cleats themselves can be tuned, for example for better roll or more freedom at the toe for braking and shifting, by replacing with different height and shape cleats (threaded, serrated, or spiked). Fastway pegs will change the way you interface with your bike.